World Short Track Speed Skating Championships at the Ahoy: from event arena to an ice Valhalla. 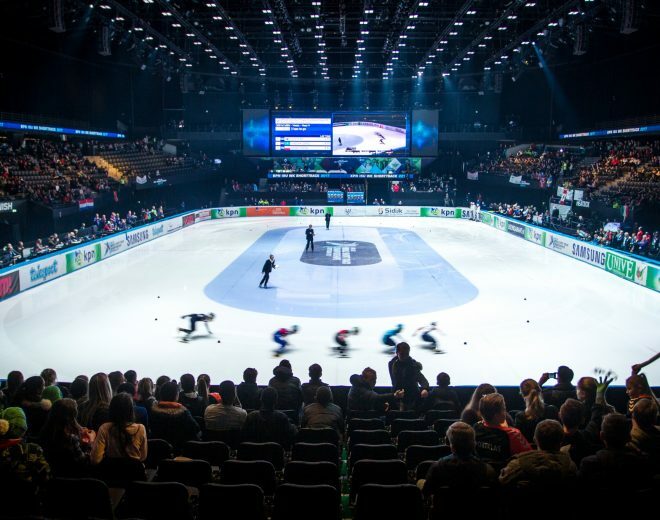 Sports marketing agency TIG Sports, a specialist in creating, innovating and organising large-scale international sports events, organised the 2017 World Short Track Speed Skating Championships in Rotterdam’s Ahoy stadium in March 2017. This was the first time a temporary ice rink was used. All speed skaters in this edition made fantastic times and delivered great performances. Ice-World was very proud to have contributed to the event! Short track speed skating has achieved massive popularity in the past few years and is a spectacular sport that attracts hordes of spectators. The three-day 2017 World Championships were held at the Ahoy in Rotterdam last March. This brought a tremendous challenge with it: holding a speed skating competition in an event arena that is primarily used for concerts. Sports marketing agency TIG Sports joined forces with the KNSB to take on this challenge. The first task was to find a supplier that could set up an ISU-approved ice rink that would fit in this environment. One of the most difficult aspects in this project is that you need to regulate the ambient air: air circulation and humidity have an enormous impact on the quality of the ice. The quality requirements imposed on a World Championship ice rink can therefore only be achieved through perfect climate control. This required a huge amount of expertise, which the customer found in Ice-World. Apart from this, it was important that the sport ice rink could be assembled and dismantled quickly so that other events at Ahoy could take place on time. Ice-World succeeded in achieving all this. Thanks to Ice-World, the concert hall was transformed into a professional ice palace within three days. During the World Short Track Speed Skating Championships, 145 participants from 38 different countries competed for 10 world titles on a perfect ice rink supplied by Ice-World. Great care was taken to ensure the right smoothness and temperature. Of course, the efficiency of the assembly was a priority too. In addition to the primary function of the rink, its energy-efficiency was also very important. It’s in this respect that Ice-World excels, with its innovative products and patented systems. Not only were spectators able to enjoy a thrilling competition, the existence of the recreational ice rink gave all comers the chance to hit the ice themselves. Besides skating, the World Championships also featured other types of entertainment, which included a great many musical performances. This made for a fantastic atmosphere both during and after the competitions. Not only were the clients and consumers pleased with the service provided by Ice-World; the athletes were too. As confirmed by short track speed skater Sjinkie Knegt: “I’m really pleased with it. There was a lot of speed in that ice.” According to competition director Cees Juffermans, the organisation’s goals were not only met, but surpassed. It was a positive experience for everyone involved, including Ice-World! Together with no fewer than 25,000 other spectators, Ice-World of course supported the Dutch skaters. The large number of visitors and the immense growth in the popularity of short track speed skating meant that twice as many cameras were needed to record the entire spectacle. There were also TV crews present from China, Hungary, Poland and Canada, and 110 international journalists reported extensively on the event. I was especially curious how the ice floor would hold up in a full Ahoy. When I realised that the ice was not an issue, I could start to enjoy it.